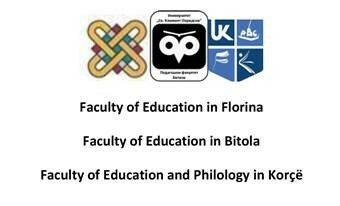 The Faculty of Education in Florina, the Faculty of Education in Bitola and the Faculty of Education and Philology in Korçё are organizing the 4th International Conference “Education Across Borders” entitled Education in the 21st Century: Challenges and Perspectives, which will be held in Florina on October 19th – 20th, 2018. The ongoing change and ambiguity of today point out the inadequacy of traditional frameworks for promoting teaching and learning, and stress the need for creating innovative learning environments. The need for innovation in education is top priority for the Faculty of Education in Florina, the Faculty of Education in Bitola and the Faculty of Education and Philology in Korçё, which take action in the same geographical area and also try to create the best possible conditions for education in the Balkans. In this vein, the Conference aims at promoting an interdisciplinary dialogue, as well as exchange of ideas among researchers–educators on issues related to skills and competencies, values and ethics, critical thinking and soft skills, multilingualism and multiculturalism, sustainability, evaluation, accountability, leadership and quality in education, etc. The conference will be held in Florina, at the main building of the Faculty of Education, on October 19th -20th, 2018. Abstracts should be 250 words long. A list of 3-5 keywords that best describe the area of your submission has to be included in the abstract. The font used should be Calibri 11pt with 3 cent margins, space: 1,5 and alignment: justified. Title, author(s)’ name(s), affiliation, email address, suitable thematic strand. Participants can cover a maximum of 2 papers. The authors who present a paper at the Conference can submit a full manuscript to be considered for publication in the Conference Proceedings. Full manuscripts will be subjected to peer-review and will be published only upon acceptance. Only those papers presented at the Conference will be submitted for peer review, in order to be considered for publication in the proceedings.